Hillary Chybinski: home decor DIY. . .
home decor DIY. . .
our downstairs walls are a sunny yellow with white trim and ceilings. we have medium brown hardwood floors. . .and currently a too-small for all of us dark green sofa. . .so this is in the realm of "can do". . . I was also inspired by Kelly's DIY projects, especially her fireplace makeover. . .I want to "whiten" my bricks - not all over - just sort of part-way. . .does that make ANY sense?? Oh and remove the HORRID brass glass doors. . .anyone have any luck with that sort of thing? 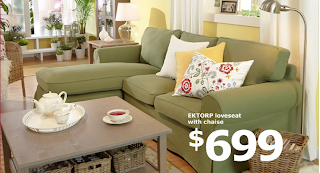 so stay tuned - this could be my summer project . . .think ikea is looking for someone to review that sofa? ?